Volcano – Volcanic ash can affect people hundreds of miles away from the cone of a volcano. Several of the deaths from the Mount St. Helens volcano in 1980 were attributed to inhalation of ash. Volcanic ash can contaminate water supplies, cause electrical storms, and collapse roofs. 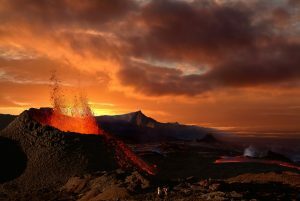 An erupting volcano can also trigger tsunamis, flash floods, earthquakes, rockfalls, and mudflows. Sideways directed volcanic explosions, known as “lateral blasts,” can shoot large pieces of rock at very high speeds for several miles. These explosions can kill by impact, burial, or heat. They have been known to knock down entire forests. The majority of deaths attributed to the Mount St. Helens volcano were a result of lateral blast and tree blow-down. Click the link below to learn how to be prepared for disasters. Landslide/Mudslide – Mudslides are a serious geologic hazard common to almost every state in the United States. It is estimated that nationally they cause up to $2 billion in damages and from 25 to 50 deaths annually.